And the first thing I run into is a topic that I have brought up before–that of the repetitive nature of much of writing video games. 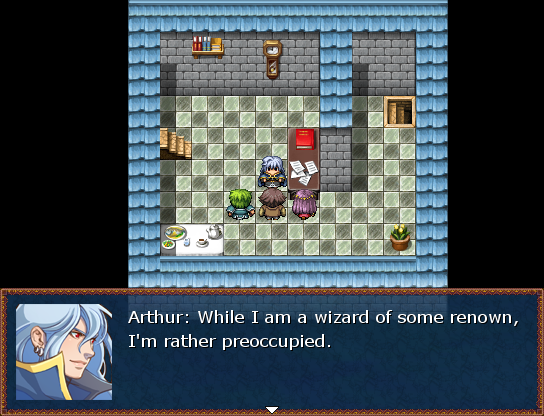 As before, I have been stuck on finishing the myriad ways of accepting and rejecting a quest from the wizard Arthur. As he is a possible love interest, there are quite a few ways to run through his dialogue. He is fun to write, but I ended up just copying and re-using his actual missive about the items that the player is asked to fetch for him. It’s just a list of items, and I really didn’t want to come up with several ways for the ponce to ask you to get him fox bonemeal, a new candle, and a smelly mushroom. My favourite thing about Arthur, though, is that Callo takes an immediate dislike to him. The quests for the other two wizards have been done for some time now. This one is all set up now, but the hard part has come up at last. I have to figure out how to make a failing condition for Arthur’s quest. He insists that none of the items can be replaced by cheaper substitutes. We have a few ideas of how to make this more interesting than BioWare would (yes, I am looking at you, bearded tongue grass), but I think I’m still a bit stuck on the mechanics. More on that tomorrow, probably. Hopefully I’m through with being stuck. Though that is still dependant on how sick I get. Less than sixty days until my due date. EDIT: Curse my own imperfection. I just noticed the typo in the second screenshot. (it went from “there’re” to “there are” so that’s how that happened) I’ll leave it. I’m not afraid of people knowing I’m a little dumb. It is fixed in-game, though. Spoony’s recent return to his Final Fantasy 13 review made me want to take another look at the game. As I recall, I had gotten about nine hours in before I just gave up with my hands in the air. When I went back to play again, I nearly did the same before I had control. Which, of course, is a rare treat in this game. If it were a paper, its central thesis would be that the player should have as little involvement as possible. There are only three characters to a party, and you only get to control one of those in fights–and thanks to the stupid scoring system that is based solely on time taken, and the fact that you begin the game with about two options, there’s no reason not to use Auto-Battle. Which is letting the game play for you. The only other control you have is walking around–in a linear corridor. The entire world is literally a straight line. The rest of the game is cutscenes, be they pre-rendered or in-game graphics. In short, this is not a game, it’s a movie. Not even a good movie. A good movie would have a story that makes some kind of sense. Heavy Rain has gotten a lot of flak for being overly cinematic and not having much replay value, but at least the story was halfway decent to basically good. Every few seconds in FF13, I find myself grimacing and asking why that just happened. Not only is the dialogue so disjointed that I am convinced that every character believes he or she is in a separate game, but there is a lot of unintentional lying. This, I think, is due to the writers being completely out of touch with the universe at large. Take my point in the post title. Bad writers, especially bad JRPG writers, adore rebellions. Unfortunately, they haven’t got a clue how to present them. Instead, we have a lot of stories where the terrorists are portrayed (badly) as the good guys. This is hilarious in its unintended failure. …less so after one sees it happen fifty million times. In FF13, there is absolutely nothing new in this predictable situation. The resistance is made up of an unrealistically small amount of people (five named characters), all of them under the age of twenty-two, they have no clear goals, and they do a lot of damage without ever actually helping people. They also have very weak reasons (if any) to dislike, let alone rebel against the reigning government. And in this case, the government comes across as more sympathetic than the “heroes” pretty much ten times out of ten. The so-called bad guys are consistently shown on the defensive. They always react to the heroes’ acts of assertive aggression. The first major event the player (read: audience) sees is a forced exile of a large number of people. What the player sees is a main character (called Lightning) attack the soldiers guarding the prisoners, and then continue to attack forces that respond to the obvious threat she poses. This escalates into an outright rebellion from the exiles, exacerbated by the terrorists (rebels? ), resulting in the deaths of exiles and soldiers alike, as well as a jaw-dropping amount of property damage. In the middle of this, Lightning “exposits” that this was the government’s plan all along. The forced exile was a lie. They had always meant to slaughter the exiles. Rather than just transport people into banishment, which is pretty inexpensive and even easy, considering that all of the people involved understood the situation and had more or less resigned themselves to it until some moron convinced them not to cooperate. But no. We are supposed to believe that the military actually planned to stop the train in the middle of this much simpler operation and sacrifice their troops and equipment in order to make a very public and objectionable display that would make the rest of the world hate and fear them along with the actual monsters they already fear. Even if they had planned to kill these people instead of just transporting them, there are better ways of doing this. They had all of the people confined to a train. GAS THE BLEEDIN’ TRAIN. Something that a thinking human might actually do in this type of situation. The only conclusion I can logically come to is that Lightning lied. It fits her personality as that blooms, like an ugly stinkflower. It also fits the events. There are absolutely no acts of aggression from the military until she provokes them. With a rocket launcher. With this kind of crap to gripe about, you’d think I would be able to glaze over the idiotic Power Rangers poses, meaningless fist pumps, and constant effing giggling. But no. That’s all still annoying as hell. The day that a character in a JRPG moves like an actual human being, Satan will start skating to work.